I've been thinking about the segment for the best part of a couple of years. The idea came to me when looking for some information on the subject of today's first "What's in Style?". For such a historically important beer style, there was very little information on Grisette available. That's changed slightly in the two years since, however none are as comprehensive as what I'm hoping to put together here. Saisons have been inextricably linked to farming throughout their history. Saisons were an important part of Belgian farm life. The full-time farm hands used the quieter winter months to brew Saison to be consumed by, and refresh, the farming hands during the warm active farming months. A side benefit of brewing in winter, was that the spent grain could be used to feed the livestock, in months that their natural food would be less plentiful. 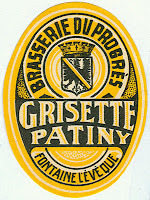 Grisette's are similarly linked to coal mining in the Hainaut province. The middle of the 18th Century brought about the start of the Industrial Revolution in Belgium. Charleroi, the major city in Hainaut province, was at the forefront of the revolution with coal mines springing up all around the region. The miners of Hainaut lived a physically demanding like. Like the farmers, the miners used beer as both sustenance and refreshment during the Summer months. Their beer was lighter in ABV and, as a product of Industrialization, "cleaner" when compared to it's more famous cousin. The etymology of Grisette is not entirely clear. The most commonly accepted theories revolve around "gris", the French word for grey. Grey is the colour most commonly associated with mining, due to the dust the workers collected on their bodies and clothing. Others say the beer is name after the porphyritic stone that was mined in the Hainaut province, which is a distinctive grey colour. While some attribute the name to the colour of the beer, with it falling in between white (witbier) and yellow (saison). Phil Markowski in his book Farmhouse Ales has a different take, which I will reproduce verbatim; "Grisette is commonly said to refer to young women who worked in factories and wore a distinctive gray frock as a uniform. As one story goes, these young women, grisettes, would hold trays of ale to refresh the workers as the exited the mines." Almost all the available literature cites one of the above theories, or a version thereof. 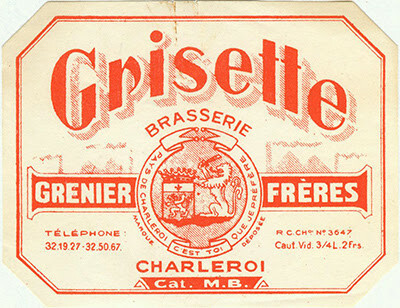 Some sources state that the beer was actually called Saison in this region at the time, and that the term Grisette was purely a marketing term which sprung up years after it's initial popularity. 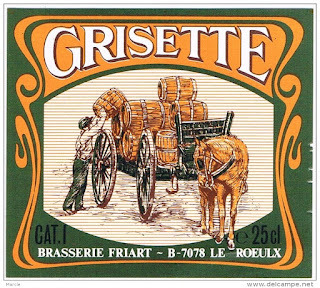 The beers sold as Grisette today tastes nothing like what Grisette would've tasted like in the Hainaut province in the 1800's. This is in part due to improved production facilities and in part due to no one alive knowing what real Grisette tasted like. 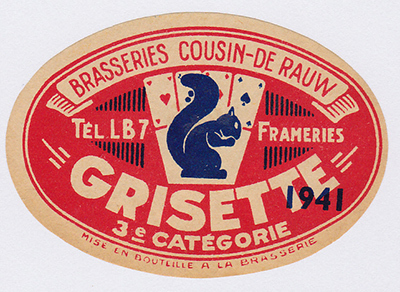 World War 2 and the subsequent downturn in the 1950's or mining in the Hainaut province, saw Grisette die out as a style completely by 1960. Beers brewed under the Grisette name have been popping up here and there since 2010(ish), but have really gained popularity in the last year or so - as brewers search for ways to differentiate their farmhouse ales from the rest of the crowd. In that sense, modern day Grisette is more of a marketing term. Brewers are more and more commonly naming their low-ABV Saisons, Grisette to stand out from a market flooded with Saisons, both good and bad. While I understand the marketing element, I'm also a stickler for correctly naming beers. Ill-informed people shouldn't say I love Grisette's when really they've had a Saison. From the research I've done, Grisettes were more than just low-ABV Saisons - but to understand the difference between past and present Grisettes, it is important to understand the difference between past and present Saisons. Much like Grisettes, Saisons have changed markedly since the 1800's. This needn't be as surprising as it may sound. Saisons by their very nature changed from batch to batch. Brewing on farms wasn't the most sanitary of practices and wild yeast would regularly have inoculated the beer. They also would've varied by vastly different grain bills from year to year; whatever grain was left from the previous harvest would make that years beer. Fast-forward to today and there is still huge variance in what different brewers call Saison; some are tart and funky and some are lightly fruity and have a cleaner yeast element. I've always though it strange how big the variation is in what's considered "Saison". 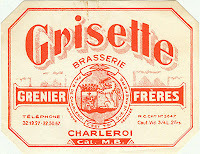 Grisettes were industrially brewed from the outset of the style. This is in part because the style evolved later, but also because of it's clear links to industrialization. This in-turn limited the variation between batches, through both infection and base ingredient change. While we aren't able to taste what 1800's Grisette tasted like, we have learnt that wheat made up as much as 10% of the grain bill. Earlier researchers spoke to people who had sampled 1940's Grisette, who were able to confirm that the style was similar but distinct to Saison. The beers were lower in alcohol, less tart, had a light hop character but were still dry and refreshing. The use of more controlled fermentation is, I think, one of the key difference between the styles. In the 1970's Saison had almost gone the way of Grisette, with only Brasserie de Silly and the makers of the famous Saison Dupont still producing Saison on a commercial scale. The beer writer Michael Jackson is credited with helping save the most famous example of the style, Saison Dupont, from extinction by bringing the style to the attention of an English speaking audience for the first time. An American beer importer, Dan Feinberg, went to Dupont to import Saison Dupont to America and was told that they were actually thinking of discontinuing Saison Dupont as it only made up 2% of sales. Feinberg wouldn't take no for an answer and convinced the brewers to try exporting to America. The rest is history; Saison is one of the fastest growing styles in the craft beer world and Saison Dupont accounts for 40% of Dupont's sales, despite almost all of that being outside Belgium! The popularization of commercial Saison production, a style that was not mass-produced historically, has seen a push towards a more homogenized product. The yeast used is all tightly controlled and their are very few Saison yeast strains available, leading to less variation. The same can be said of the malt bill - with Saisons trending towards a drier, cleaner finish. The beers no longer change from season to season depending on what grain was available. The mass-production of Saison, saw the product become more and more like historic Grisette. My research has led me to conclude that modern-day Saisons, on the whole, are more similar to historic Grisettes than they are to historic Saisons. There are obviously exceptions; La Vermontoise, a collaboration between Hill Farmstead and Brasserie de Blaugies, was properly tart and funky and springs instantly to mind. Both styles were intended to be dry and refreshing, with the two main differentials being the cleaner, less wild, yeasts of Grisette and the ABV. The cleanliness of the yeast, and subsequent lack of tartness, appears to me to be the most important distinction, whether this is between historic and modern Saisons or between Saisons and Grisettes may be semantics, but is in fact why we are here. As a stickler for beers being brewed to style; I would like to see all beers called Grisette to fulfill all of the following criteria. The first conclusion I drew from this exercise surprised me; it is modern day Saisons that are misnamed, more so than Grisette's. Both styles are noticeably different to what we presumed they would have tasted like when consumed by workers in the 1800's, with Saisons loss of tartness the most apparent. I understand the reasons behind the homogenization/cleanliness of Saison, with consumers demanding the same taste from their favourite beers all the time. I just wish we lived in a world where Lambic and traditional Saison were understood by a wider audience, and that people understood that beer can change and evolve in the same ways, if not even better, that wine can. 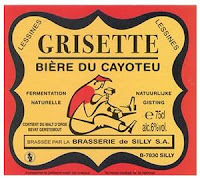 Marketing; a ubiquitous part of 21st century life and responsible for the revival of beer terms, like Grisette. In 1970, the people of the Hainaut province of Belgium may have been able to recall Grisette beers. By 2000, the term would have been gone from the memories of all but the most strident of Grisette fans, and certainly no one outside Belgium would know the term. 2016, sees a number of beers called Grisette not seen since the late 19th century and most of them being brewed outside of it's historical heartland. The rise of craft beer in America has seen many of these historic terms and styles resurrected from the dead, as brewers tried to make their beers standout from an ever more crowded market. 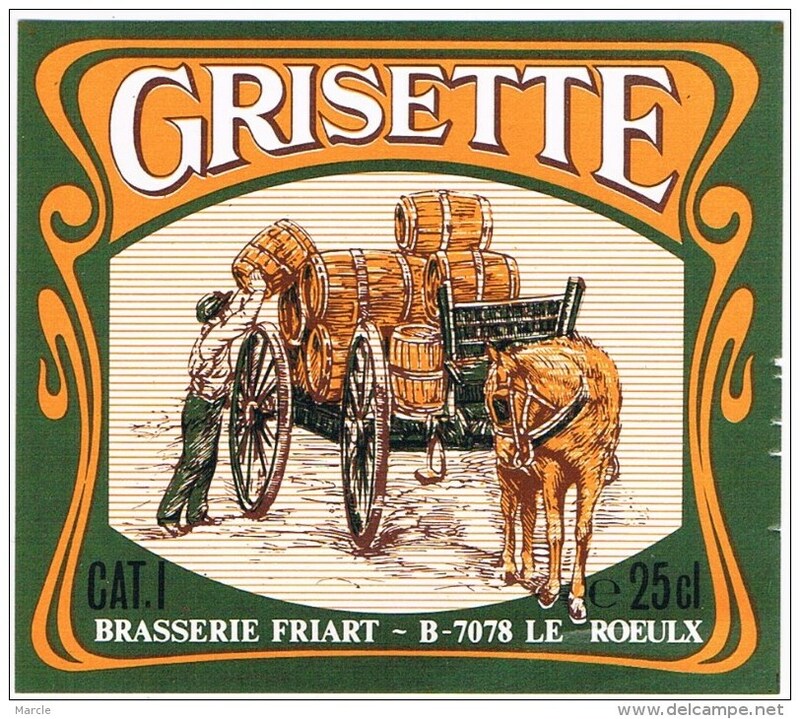 I feel that how Grisette is used now, is inaccurate in many ways, but strangely that in most cases, it is a more accurate term than if the brewer had simply called their beer, the more popular term, Saison. This is a rare occasion, where marketers have put their spiel on a product and actually turned it into a more accurate descriptor of the product. The average consumer almost certainly doesn't care, but I think it's fantastic! churning it over in my head for a few days and find myself coming back to where I entered this post "Low-ABV Saison". 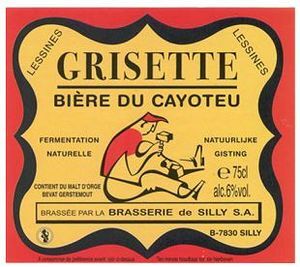 After forming the premise that modern day Saisons are more like high-ABV historic Grisettes, I think the easiest way to explain Grisette to modern day drinkers is that; Grisette is like a low-ABV version of what you call Saison, whilst true/historic Saison is not what you think Saison is. I understand that this explanation won't be for everyone, or that many drinkers don't care about the evolution of the style, but I feel that this explanation will appeal to many of you who have finished reading this mammoth essay I've written. It certainly works for me, in a very wordy/nitpicky way. I hope that piece has answered most of your Grisette related questions. As I'm not, currently, a homebrewer it's a little (read: very!) lacking from a technical side of things, but I hope gives you a base understanding on the history of the style. Some acknowledgements are in order. the works of Garrett Oliver, Phil Markowski, Stan Hieronymus, Jeff Alworth, Dave Janssen and other forum contributors have been used to form the ideas for post. I'd love feedback on what you guys thought of this post, whether you're a regular reader or someone who's found this post through your interest in Grisette/Saison. Please either email me (gus.norris7@gmail.com) or comment below. Hopefully there will be a further What's in Style post in the future, if anyone has a style they want to know more about let me know and I'll see what I can come up with. thanks for the article! it's great, I didn't knew much of the beer style. As all XXth century saisons were clean and probably all beer styles were somewhat tart or funky until the mid XIXth, why are we more and more associating lactic and brett to saisons as if it's a part of the style (same thing for bières de garde). And not for stouts, ipa, abbey beers ? (ok for grisette as it is a recent beer style). Finally, why do we refuse 2 centuries evolution of this style ? Is it not just because of a romantic vision of farms ? As to the answer to the bigger question; I think it ties into my answer above. Saison I think of as a artisinal farmhouse product, rightly or wrongly, which in turn leads to the idea that lactic acid/brett flavours would be part of the finished beer. I think that I hang onto the history of this style more - is that it was a traditional style that craft brewers tried to replicate, as opposed to IPA's which the American's changed completely (or bastardized, depending on your point of view), hence why we distinguish between English IPA's and American IPA's. An English IPA you would expect earthiness and restrained bitterness, while an American IPA would not be such without aggressive bitterness and citrus qualities. In short, I don't know why I refuse the history of some of these styles, English Porter for example was definitely sour for a time, yet I would class it as wrong/infected if I was offered up a sour Porter. I would like to think on this a little more. Thank you for your question; it was an element to this broader discussion that I hadn't thought of! Thanks for the mention Gus! Just stumbled across this and it is a well-written breakdown of grisette. 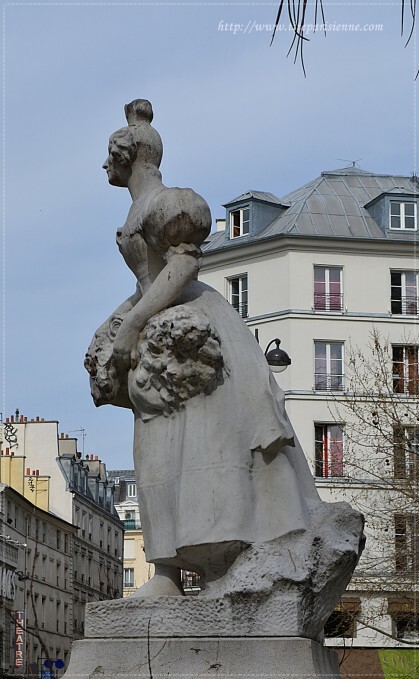 In regard to Guide-Bièreès comment, all XXth century saisons were certainly not clean (and grisettes date at least to the beginning of the 1800s). It was well into the 20th century that saisons became clean beers and historical texts refer to saison as acidic and, at times, comparable to lambic (see Le Petit Journal du Brasseur, 1946). 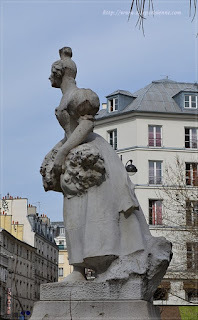 With that said, it is a valid point that (especially in the North American market) saison can be treated as frozen in time with regard to it's rustic connection while other beers are allowed to progress through time. So I think it is a valid point that the romanticism can do a disservice by not allowing the style to advance. In the end I think saison has come closer to historic grisette than the two beers would have been historically, which is fine with me. Whoops, sorry for the typo. Should say Guide-Bière's (forgot to switch my keyboard back from Fr to En). Thanks for your feedback Dave - I'm quite humbled! I think the freezing of the Saison style, particularly in North America (and by extrapolation Australia), compared to other styles and how they are able to evolove is quite an interesting point. It's something I may explore at a later date. Keep up your great work - I love reading your stuff! Thank you for your research and well written article - part of my inspiration for the brew deck tomorrow as I'll attempt my first grisette! I'll write about it in my brew log at traildogbrewing.com in the coming weeks.